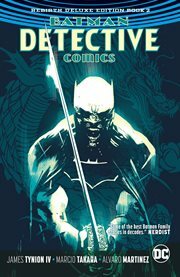 The item Batman detective comics : rebirth deluxe edition, Issue 950-962, James Tynion IV, Christopher Sebela, writers, (electronic resource) represents a specific, individual, material embodiment of a distinct intellectual or artistic creation found in Kent District Library. This latest Rebirth Deluxe Edition features two of the most critically acclaimed arcs in the Dark Knight's history in hardcover for the first time in Batman: Detective Comics: The Rebirth Deluxe Edition Book 2. Batman's newest allies both have histories they'd rather forget, but when figures from their respective secret origins appear in Gotham, will Cassandra Cain and Azrael be able to keep their pasts from destroying their present lives? When the League of Shadows-led by Cassandra's mother, the deadly Lady Shiva-comes to take down the team and bring Cassandra home, Orphan must weigh the life that was planned for her against the new path she's forging for herself. But what place can society ever have for someone with her violent pedigree? Then, Azrael's former masters, the Order of St. Dumas, send the perfect assassin-an artificial intelligence named Ascalon-to hunt their ex-disciple and all who stand with him. Batman and Zatanna need the power of a mystical artifact called the God Machine to turn the tide, but will the Machine's promise of absolute power corrupt even the World's Greatest Detective?